Many of you have asked for our trusted source of essential oils, and we’re happy to share our favorite with you today! Mountain Rose Herbs (www.MountainRoseHerbs.com) is our go to company for so many reasons. They have a great, secure online store so anyone can order the oils and have them shipped direct for a great price. They are a highly transparent, certified organic essential oils provider. They offer a 10% discount to herbal education students (at participating schools). They share the sustainable living beliefs of our diyNatural community. They actively work with other great organizations to educate and make our world a better place. Obviously we’re happy to partner with them, and we have more great news. Mountain Rose Herbs was excited when we approached them about collaborating and said they would love to offer one lucky diyNatural community member a free 12-pack of essential oils (the same 12 oils you need for all the recipes in our homemade cleaners book)! The total value of the oils is: $67.50, plus shipping is free! And again, these oils are the same 12 oils you need for all the recipes in our homemade cleaners book! Use the Rafflecopter widget below to enter any of the ways listed there. You only need to complete one task to enter, but the more tasks you complete, the more entries you earn. This contest is open to all U.S. residents. It begins on Thursday, November 1st, 2012 at 6am EST and ends at midnight EST on Sunday, November 4th, 2012. The winner will be announced to all email subscribers and Facebook followers on Monday, November 5th. Mountain Rose Herbs essential oils are 100 percent pure steam distilled plant oils with great fragrance, depth, and keynote. The oils are free of carriers, diluents, and other inputs. They carry some of the world’s most magnificent therapeutic quality oils from reputable distillers and suppliers they know, trust, and have a wonderful working relationship with. MRH is so confident in the quality of their oils that they offer gas chromatography analysis and specifications on the volatility and integrity for many of the essential oils in stock. As per their commitment to organic agriculture, they offer one of the nation’s largest selections of certified organic essential oils. Considering the amount of pesticide use from the planting to the harvest, they are very concerned about the low quality and potential health hazards associated with many conventional oils. All of the essential oils offered by Mountain Rose Herbs are supervised by Christine Guerts who is accredited as a Certified Aromatherapist, and she is responsible for every step of their essential oil acceptance protocols including the location of harvest, methods used to extract the oils, data reports assuring the oils character, and what type of materials are used in the distillation process. Since 1987, Mountain Rose Herbs has been known for its uncompromising commitment to organic agriculture, sustainable business practices, and a steadfast focus on the pure aesthetics and freshness of botanical products. Their wide range of certified organic product offerings includes bulk herbs and spices, aromatherapy and essential oils, tea and tea supplies, and natural health and body care. Every aspect of product creation is carried out in accordance with strict quality control and organic handling procedures by employees who care. From fragrant and beyond-fresh organic herbs and spices, to soothing essential oils and delicious herbal teas, the quality and integrity of Mountain Rose Herbs is unparalleled – with smiles guaranteed. To learn more about Mountain Rose Herbs please visit www.mountainroseherbs.com. Mountain Rose Herbs is a great company. I’ve ordered their products before and been very satisfied with the quality and their customer service. Their reishi extract is excellent. I’d love to win these. I want to start making soaps and scents again. My favorite herbal products have recently become essential oils, iv been experimenting with them a lot recently with making lip balms and salves, so far iv tried the mountain rose herbs spearmint, sweet orange, and clove bud oil, all of them are amazing and everyone iv given the lip balms too has fallen in love with them and buys them off of me now. I have recently started using essential oils, and am excited to make my own body butter, especially since Christmas is coming up soon! I really enjoy the DIY tips and recipes and look forward to each email I receive. I was especially pleased with the email regarding the Mountain Rose Herbs Essential Oils. I use many essential oils and like to find new places where so much care is taken with the production. I am looking forward to trying these oils. Great giveaway!! My favorite is Peppermint! It is a great scalp reliever. It’s very relaxing. I love garlic! I use garlic in literally almost everything I cook, it’s good for the blood, it’s good for the immune system, and my favorite use for it is on ear infections. A couple drops of garlic oil into the ear canal, lying on your side, let it sit for a few minutes, then turn and let it drain out into a tissue. It works like magic, and much faster than anything traditional I’ve ever used. LOVE garlic! I love using lemon and lavender essential oils around the house for cleaning. They make everything smell fresh and clean! Thanks for the great giveaway! I LOVE lavender anything! I use the essential oil for cleaning and also in many of my homemade beauty products. All I can say is I absolutely love this site!!! I have been interested in being healthier for a while now. There is just so much I don’t know and not always sure where to start; this site has helped me learn so much! I still have alot to learn so keep the information coming! I would love to win some oils! I’ve been making a few of my household products; I LOVE IT!!!! My next endeavor is make my own toothpaste so some oils would be perfect!!!! I LOVE essential oils… would LOVE to win! I have been looking for a place to get good quality essential oils. There are several recipes I have been wanting to try that require different oils. I hope I win these! My favorite essential oil is Peru Balsam. I use it when I make bar soaps because the scent is clean and fresh and it lasts well over a year in the soap. What a wonderful giveaway! Would be fantastic to win! tea tree oil is the best! I would like to try peppermint or spearmint.I have used lavender and tea tree in oil soap and really liked the lavender. I have a smaller set of oils that are running out… I find that I use the lavender, tea tree, and sweet orange ALL THE TIME and they are dwindling. Great website! Just started making my own stuff (shampoo, conditioner, diaper wipe solution, cleaners) a couple of years ago. A few drops of tea tree oil in the diaper wipe solution works great to keep my daughter fresh and clean. Next on my list is making my own body lotion and face cream. So hard to pick a favorite, but lately I’ve been relying on homemade elderberry syrup for immune support. Completely awesome…I’ve just started making my own “stuff”, started out with cooking a couple years ago and now moving on to other things! I only buy my herbs, oils and resins form Mountain Rose! I love adding peppermint and eucalyptus to my bath. Also started making my own toothpaste with clove and peppermint oil. Amazing package! Would love to win. I have been making my own natural cleaners for several years but am always looking for new recipes, especially ones which include essential oils. Winning this 12 pack of organic essential oils would be fabulous, but even if I don’t win them I’m glad to have learned of this organic essential oil company! I love essential oils. This would be awesome to win. Sign me up! 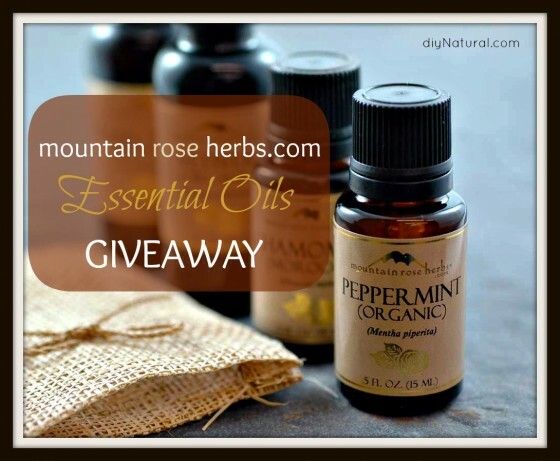 Thanks for the giveaway – I am a big fan of mountain rose herbs. Mountain Rose is my go-to for natural skincare products. Their argan oil is lovely and all I use on my face! My favorite herb is vanilla because it just has that wonderful aroma that always makes you feel warm and at home. I have tried a couple essential oils from my local food co-op but would love to try more if I win this giveaway. Thank you!!! I LOVE the Essential Oils that I have tried so far. I want to learn how to make more of my own cleaning and beauty products! I would love to give any of the eo’s a try- thanks for an awesome giveaway! love the smell of lemon verbena! !all herbs are unique and wonderful would love to start using essential oils! mountian rose herbs are the best so thank you! I have recently decided to start making my own beauty care products. So far my fave essential oil is lavender. Want to expand and make even more DIY products including my own hydrosols. I would love to try MRH’s essential oils; quality is so important with eo! I find myself reaching for my lavender oil more than anything else. It’s just so useful. I’m new at the natural remedies but am really excited for my journey of living a more sustainable life. Essential oils are the only way to go in order to cut out all the additives. I am transitioning our whole house to chemical free cleaning. Great site, thank you! I’m new to EO’s but I’ve been having a blast making homemade body butter, lip balm, shampoo, and acne treatments. This looks like a great giveaway. I have started making my own body care products and home cleaning items, so this could really come in handy. I find that diluted tea tree oil is great for helping acne as a topical treatment (dab with q-tip) or add it witch hazel for a toner. I would like to see a cannabis oil with the inactive THC. Perhaps it holds an ability for a healthy scalp or maybe the stimulation of capillaries at least. I love Mountain Rose Herbs! This would really help me restock my cleaning kit before winter cold season kicks in. I would love to try some different EO for making cloth wipe solution. We have been so blessed to experience the usefulness of essential oils. We use tea tree oil for so many things now and are learning about the benefits of other oils. I am also so excited to have found out about DIY natural! I’ve always wanted to try Mountain Rose essential oils! Arnica is my most used herb. I am very excited to start using EO and lavender is one of my favorites. I use essential oils in everything. They are so great. I am careful with tea tree because it can cause cats issues (so I hear). I use one oil in a TBSP of milk and add it to my bath. The fat in the milk causes the oil to not float in bubbles on top of the water. I would love to win this. I have to check your website daily to see what new things you have to share. I get excited learning about natural ways to clean, etc. Tea Tree oil!!! It’s the most awesome of all the essential oils, in my opinion. I LOVE peppermint it smells so good and it works perfect for cleaning the house and brushing my teerth! i would love to try some lavender for my babys body wash! oils in the Republic of Panama is every expensive and they are hard to find. we are never sure if what we order will arrive. My family and I are on an adventure to reduce our carbon footprint and live a more self-sustainable life style. I found your website while looking for homemade toothpaste recipes. I am amazed at all of the really simple recipes to make the products that we use every day. We are already saving money and the environment. I love it! And I love to hear what other like-minded people have to say about their journey to self-sustainability. Thank you for creating this community! Would love to win some of these. I have some that I use, especially lavendar, but I constantly want to try other oils out. I’ve been so interested trying to use essential oils, especially tea tree and grapefruit. I have a new baby at home and have been really trying to go all natural in household cleaners and body care items. I love using EO’s! So far my favorites are tea tree oil for the antibacterial properties in my homemade dishsoap, and peppermint oil in my home toothpaste! Still learning about them- but I am sold on their wonderful uses! I love lemon because it makes my homemade cleaner smell less vinegary! We use essential oils in most of our products but I especially love Lavender for its many uses! I have a terrible disdain for mice in my garage…my partner has the same sentiments toward spiders. Peppermint oils sprayed around the garage and no pesky critters! My favorite herbal product is milk thistle for general health. I enjoy lavender oil for it’s healing, relaxing and cleansing properties. Lavender proved useful to counter the personal impact made by hurricane Sandy. I’m new to essential oils. Look forward to learning more & trying the different combinations. I have not used essential oils yet, but have been wanting to incorporate them into my life. This would be a great way to get me started! Unfortunately I’m here in Canada .. Would have loved to be able to enter this giveaway 🙁 .. I enjoy reading your emails and learning how to DIY .. In an environmentally good way. Keep up the good work. I am always interested in information regarding EO this is all so new to me. I would love to win your wonderful essential oils giveaway! Great giveaway! Love to use essential oils. I have been ogling over these oils for months, it would be awesome to win so I could give them a whirl! I’d love to try some EO- I’ve never used it in my homemade products. I love Japanese Cherry Blossom and linen. I started using your recipes for natural homemade cleaners during the summer but haven’t gotten any essential oils yet. The sample kit would be an awesome way to try many different oils out! I love the lavender oils for the way the smell, and their cleaning abilities, as well as tea tree for its cleaning uses! Using more and more lavender! I love the few EOs I have, although they are not of a high quality. I have used them in many projects and I hope to continue, this would be an awesome way to experience many new EOs. I am new to the uses of essential oils. I am in love with lavender and want to try more DIY recipes! I want to try the lime! I love oils! Wonderful giveaway. Love your blog. lavender is my favorite so far but I would so like to try others! oh.my.gosh! What a great giveaway! I have only heard about all the benefits of using EO’s….I would love to have this set to experiment for myself! I like burdock root for the skin. I love lemon EO for cleaning! I’d love to win this giveaway. I have had lavender and peppermint on my list for awhile but would love to try them all! My favorite herb is peppermint! Love its ability to give me a quick pickup at 3pm so I can avoid caffeine. This is such a totally amazing chance… I would love to win this collection. I do use oils. Tea tree, lavendar, rose geranium,,, and a few others would love to try the mint varieties. : ) and have the opportunity to learn more about various oils and uses. I love using lavender. Mostly I use it for relaxing and perfume, but I am super excited to use it in my homemade shampoo. Thank you DIYNatural for the awesome ideas!!! SO EXCITED!!! I sure hope I’m picked! I am a “newbie” at diy/frugal living and have recently began implementing in baby steps so this would be a fantastic win! I would love to try the lavender. I could use plenty right now. For example, being a first time mom with a one year old I could use it in the bathroom and bedroom to relax. I’d love to have this great set of oils! Great giveaway. Ooo, I love dried lavender in warm rice pouches and peppermint EO for pick-me-ups and lemon EO in cleaners. Mmmmm! Would love to win this! I have so much more to learn! Lemon is zesty clean, reminding one of fresh air and Doris Day. As Doris Day used to sing, “Lemon tree very pretty and the flower it is sweet but the fruit of the poor lemon is impossible to eat.” Doris Day always had that sweet like the flower appearance and was zesty clean. Doris Day was wise because the fruit of the lemon is impossible to eat…so we use it to give everything in our house that zesty clean smell. I would love to win this. I’m just now really getting into EO’s. I have ordered from MRH before, and thought they were wonderful. I’m a huge fan of lavender. My old violin teacher’s yard was full of them, and the smell is special to me. Thanks for the giveaway! I love using essential oils although I am fairly new at it! I love using essential oils in my homemade products. I also love Mountain Rose Herbs products. Hello! I absolutely LOVE lavender oil, it’s my overall fav. It can be blended with so many other EOs to make wonderful blends, but it’s also just great on it’s own! My favorite herb has to be arnica. It seems like I am always rubbing in somewhere. I am also a big fan of echinacea. I buy all my herbs from Mountain Rose and have never been disappointed. I am learning so many herbal type things these days. I have used lavender oil for years for my headaches. I am looking at medicinal uses of herbs, foods, etc – mostly diabetic. I will try to make my way thru a lot more of the essential oils with their properties and uses. I would love to learn how to make more from scratch (soaps, lotions, etc). I have never tried this brand and would have so many uses. I have purchased Young Living essential oils. These sound of high quality and natural. I like peppermint for my sinuses and lavender for burns. So far I’ve only used tea tree oil for antiseptic and mold removal, but would love to have more oils to make all sorts of things. I like using tea tree oil. Nice to know you’ve got all the anti-bacterial properties without the poisonous chemicals! I love essential oils and there are tons that I’ve never tried that I would love to! Love DIY natural and Mountain Rose Herbs! I’m going to make lotion soon.. these EOs would be perfect! I love lavendar oil for its healing and calming properties. I would love to win the oil set, the purer the better! Lavender oil is my favorite so far. I use it in many things. I’ve always wanted to try lavender I just think it will smell so good on my sheets :D.
I adore lavender essential oil, plain and simple. It smells so wonderful in an oil warmer!!! I love these products. My favorite essential oil so far is lavendar but I also enjoy their herbs. Would love to win some of these. Since I am a busy college student … Valarien root has been my go-to for unwinding after a long day of studying. I just bought a bunch of goodies from Mountain Rose Herbs and I am more than thrilled to make some lotions, deoderants, and cleaners with what I bought. My favorite herb or herbal products are essential oils and coconut oil. EO because they can healing and help in so many different ways and coconut oil because it can be used in so many products and because of the healing and repairing it can do for the skin and body. We love eucalyptus to keep our noses sniffing properly! I love calendula, elderberry and arnica root!! I only use Mountain Rose Herbs for all of my essential oils and herbs. We absolutely love them and look forward to our purchases every time! I love the smell of tea tree oil! plus it make my eczema go away. My faves are lavender and tea tree!! I would love to earn some eo for free!! I am on a tight budget right now, but am so interested in them and their therapeutic nature!! So far, I can’t get enough Tea Tree…but that’s really the only one I have owned! I love and use so many of those oils!! Right now Tea tree oil is my favorite however I have been really wanting to try Lavender. My favorite essential oil is lavender, and I love using it in my homemade deodorant. I use tea tree oil in my homemade liquid dishwasher detergent. For inhalation, therapeutic massage, fragrance, baths, foot bath, hand bath, shower, sauna, jacuzzi or hot tub, room sprays, pillow talk, perfumes, pomanders, pot pourri, handkerchief, shoe rack, humidifers, ring burners, wood fires, scented candles, compressses, body or facial oils. Peppermint Essential oil is my favorite. It’s crisp, cool scent is revitalizing. Great for respiratory congestion, burns, and cooling in hot weather! I am a fairly new convert to organics. I have heard of Mountain Rose herbs essential oils and would love to investigate their uses. I use essential oils often for many things – Air freshener, body moisturizer, in the bath, as an antiseptic. I definitely want to learn more about the power of eo! I do love essential oils. I use a wool felted ball sprinkled with essential oil in my dryer instead of fabric softener due to hubby’s allergic skin. The ball beats out wrinkles and static and the essential oil makes everything smell great. Love lavender, and can’t wait to try some more. I cannot live without lavendar! I have rhuematoid arthritus and my body reacts to a “flare up” by having chronic hives. The hives can last for weeks to months…no medication helps relieve the itching. Lavendar oil has helped my skin, it is very soothing. The smell calms me down too, which helps my body get back on track. I grow lavender and rosemary, and love using tea tree oil in my homemade cleansers. I have a companion rabbit, and try to use essential oil based cleaners exclusively as rabbits have VERY sensitive respiratory and digestive systems. Lavender oil is my favorite, and its my bunny’s fave too! I give her massages with it, and spray some (mixed with water) in her crate when we go on car rides to help calm her…it really works! I have a ton of use ideas for tea tree and lavender oils! Love their products. I really like the Eucalyptus oil. I haven’t tried mountain rose oils, just young living. But I would love to win! I’m new to the world of EOs and anxious to find a favorite. I love Mountain Rose Herbs! Thanks so much for this giveaway. I use essential oils in my soaps. I’ve been working on saving up to buy some essential oils, this would more than jumpstart my collection! i can’t say as i have a favorite herb…i love licorice root for it’s adaptogen properties. adaptogens are phenomenal period since they are balancing to the entire body. i love milk thistle for it’s support and “mothering” of the liver. as far as essential oils go – sandalwood is my all time favorite. it’s fragrance transports me. I’ve been wanting to try some essential oils for the longest time…but have yet to get online and order some to try! I LOVE these essential oils, and would LOVE to have them to add to all the cleaning tips I learned from the book!!!! Thanks so much for this article. I needed to buy some essential oils but was not sure of a good place to buy them. Love them all,but cloves and peppermint. I love experiementing with different scents and combos! I add them to homemade salves and lotions. I am just getting into using essential oils and I’m loving it! Learning so much! Thank you for this opportunity! I’m crazy about lemongrass! I wish I could have more, but they’re just a little too expensive to justify buying all of them that I want. Great giveway! Thank you! I’ve been a fan of DIY for quite awhile and I want to try all of the different oils! So many ways! Thank you. My favorities are Lavender and Eucalyptus. I am a huge fan of mountain rose too. I can’t have enough of these oils around! I’d like to try the Rosemary and Tea Tree. My hands down favorite essential oil is lavendar. I use it in all of my homemade household cleaning products, and my friends are always commenting on how nice my house smells and asking for my secret. And I always share! Lavender is by far my favorite!!! Oh! yes please – I love Mountain Rose! I think my favorite oil is lavender. It has so many uses that I find myself using it several times a day. I’ve found lavender, eucalyptus, or tea tree oils to be helpful and fragrant additions to the general and window cleaners you’ve posted. I use grapefruit or lemon oil in the dishwasher detergent. I can’t handle artificial fragrances at all, but organic essential oils cause me no respiratory problems at all. My all-time favorite herb is lavender. I use the flowers in cooking and teas and the essential oil goes into all cleaning solutions. Just love that smell! YAY!, I’m so happy to hear about this giveaway!! I’ve been wanting to purchase from Mountain Rose Herbs for a while (I have a list gathered up but haven’t gotten around to it yet) – it’s so amazing to me that you can make healthy foods, teas, AND cleaners from herbs and their extracts. I never usually win anything… I bet I won’t this time either, but it’s always worth a try!! Tea tree & lavender are favorites in our house! I have gotten so many great DIY ideas from you! I love getting your emails & FB posts! I like to use Shea Moisture ! It works great for my natural hair. Great site! I love using lavender essential oil , especially in the dryer (a few drops on a damp cloth gives clothes a gentle fragrance), and I use lavender or lemon when making homemade deodorant (which works fabulously). My favorite oil is grapefruit! I love having it around the house, it smells so great. i love all things natural. I love tea tree oil! My favorite is to add a couple drops to the laundry when I wash the baby’s diapers. It’s antifungal/bacterial/viral properties get those diapers extra clean and keeps them smelling fresh. I so appreciate the style of your blogs, uncluttered with silly or witty chatter that I have to wade through, just fresh and informative. First found you while looking for a homemade laundry soap recipe, liked what I saw, and have enjoyed your daily emails ever since. Haven’t used essential oils yet but have been doing much reading about them. Glad to know of your trusted source for them. When we started to go all natural I slowly began to gather a few essential oils from the health food store. We use two for making soap. I substituted peppermint oil for Matt’s peppermint extract in his toothpaste. I like being able to control the amount of scent. The DIY way is light and pleasant, not overpowering. I have read about Mountain Rose Herb and would love the opportunity to try it and share my experience. I love using essential oils! I think my favorites are lavender and peppermint. They’re both so soothing. I love making all kinds of herbal teas and tinctures, but I haven’t ventured into essential oils yet. I can’t wait to try them! I already subscribe to DYI newsletter. It is a great blog to read. I have tried Lavender and use it for almost everything. We used it for bee sting bites, mosquito bites, headaches, stress reliever, lots of wonderful uses! I am amazed at how well, Lemon, Lavender, vinegar and baking soda work so well as cleaners…(not in that order) I love making homemade cleaners with your recipes. Your book you have for all the DIY is very helpful. I made a salve for a rash that my son had… simply Coconut oil, Lavender and iodine. Amazing how simple we can make life by being natural. Mountain Rose Herbs is an amazing place to buy all your oils and everything else you need for DIY. I love aromatherapy! I use the oils in a diffuser as well as making skin care products. I’ve also make my cleaning products with them. I would love to win this wonderful giveaway. Thanks so much for the offering it. I LOVE oil of oregano, especially around this time of year and with flu season coming soon. It is a natural antibiotic. I want to use grapefruit though, I hear that’s a great one. I use peppermint in my homemade mouthwash! Oh and I use lavender, rosewood, peppermint and lemon essential oils like crazy! My favorite essential oil is tea tree. I love it in a lot of my beauty recipes as well as around the house for cleaning. I have been lurking on this website for quite some time and this is just the incentive I needed to make myself known! I have loved mountain rose herbs for years now and never had the chance to spoil myself with their gifts – this is an awesome opportunity! I love DIY Natural and Mountain Rose Herbs. Thanks to both! Would love to win!! I use essentials in my lotions, insect repellant, body butter, lotion bars. My favorite is Lavender. I love spearmint…it is so relaxing…mix it oil to create a candle…i could leave it burning all day! I don’t know much about oils but am excited to add them to my daily routine because I have read so much great stuff about them! When I click on raffle button to enter.. all I get is internal error? I’m still learning, but I just got some lavendar to use for sachets. Tea tree oil! Amazing stuff, love it. Thanks for the giveaway! Love Mountain Rose Herbs! This is a great giveaway. I love Peppermint Essential Oil, I use it in my toothpaste! Also tea tree oil. Would love to try the rest! These would definitely be put to good use! I love tea tree oil! My skin is really sensitive to dirts after I get my eyebrows threaded, so I put a little on the area. Its antiseptic properties keep my skin clear. The essential oils I use most often are lavender and tea tree. I’m still pretty new to essential oils, and mainly use them as fragrance, but I love using herbs in a lot of my cleaning and skin care recipes. I also love Mountain Rose Herbs. Would LOVE to win this! I’ve been making all of my own beatuy care and cleaning products for a few months now and this would be a great starter set so I can branch out and make more things. Love your site, it is truely such an inspiration in my life. Great job guys! My favorite oil is Tea Tree oil. I use it to clean with. I have to pick one?! I guess lavender and plantain are my favorites. I am learning to be living more green and to clean better and naturally. This is a good blog. We use tea tree oil for so many things. I am excited to learn how to use more oils for our health and home. Thank you! I love lavendar oil, it’s good for almost everything and smells devine! I have very sensitive and dry skin and I have been researching many ways to minimize the amount of chemicals I use. I love this website as a source of awesome information and I REALLY hope to win the oils!!! I am just beginning my journey down the sustainable and natural path. I have used some oils in the past but mostly as fragrances. I am very excited to learn the traditional and medicinal use and this 12 pack will really help with the learning curve. Many thanks to you and MRH for the giveaway! I am excited to start learning about making my own air fresheners using essential oils without all the toxic fumes. I love this site (DIY Natural) I am constantly learning something new, and although I used to “shop around” for my herbs, oils, and such, but since I got my first order of herbs from Rose Mountain Herbs, I haven’t gotten them anywhere else. you don’t get herbs this fresh any where else in my opinion. I’d like to visit someday. I am still pretty new to DIY stuff and am learning lots. I’d love to win the essential oils so I can try out more of the things on my “to try” list. Great giveaway! I have just recently started living greener and would LOVE to win these essential oils! Thank you for such a great website! I love rosehip oil and almond oil. They are now my moisturizer day and night. And hubby started using it too. Love it! My health coach has been introducing me to essential oils and their wonderful powers. I would love to learn more about them and incorporate them into my life! My favorite is lavender. It is so soothing. Rosemary is a close second. I have wanted to get and use essential oils for a long time. I would love to win these and learn! I have never used essential oils before, but have tagged about 1 billion recipes to try. Rosemary and peppermint were on my list to pick up, so I’d be excited to have any of these! Awesome giveaway! Tea Tree is great for an anti-bacterial. I’m fairly new to the natural herbs and oils. I’ve been making my own laundry detergent for the past year. I’ve also been making the occasional sugar scrub with natural oils and herbs, but haven’t tried any herbal remedies. I would love to start! I’d have to say my favorite oil is tea tree oil! It is so good for everything! Its great for a cold, great for an infection, great for alot of things, and it smells really fresh and clean! Love it! A giveaway! I’ve put off buying them because, well…I don’t have the money right now. I have a few of the scents already, but would love to add to my collection! LOVE the homemade cleaners book that I purchased for my Kindle app. Thanks! I haven’t ever used Essential Oils, but I’m interested in adding them to a wipe solution for baby wipes. I’d love to try the lavender. I’ve also hear great things about the Tea Tree Oil. I love essential oils, and this variety is great! Lavender is my favorite for cleaning — I mix with vinegar to mask the smell and use as a multi-purpose cleaner! I love Mountain Rose Herb Essential Oils. I have used the Lemon and Sweet Orange in my cleaning solutions with great success. I also love to use Tea Tree Oil and would like to explore that more with using it in my first aid kit. Thanks! I am looking forward to trying all of these essential oils! I am trying to live a better, healthier, natural life. Thanks! I have always been interested in using essential oils, but never really knew where the best place to purchase was. I would love to use essential oils! I love all essential oils!! I love Mountain Rose herbs. I have been using their website for quite some time now. Besides their essential oils, they also carry a lot of other great natural products. I am delighted to see DIYNatural partner with them!! I LOVE all the information here!!! Thanks so much for sharing! Great products! Love being more kid safe and smelling amazing! Love essential oils! There are so many uses! I’ve heard of this brand, hope I win! OMG Awesome! Thanks to you guys, I’ve been green cleaning for a couple of years now. But I would love to have all the essential oils… I am currently only with Tea Tree and Lavender! LOVE Lavender! So many uses! Thank you so much for all the great ideas. Awesome giveaway. Love the book and use essential oils all the time! Grapefruit EO is my absolute favorite. It makes me happy, has a clean smell to it and use it in a lot of my favorite recipes! I have just started to go natural and I don’t have any essential oils…winning this 12 pack would be a great way to push me to the next level. I love using tea tree oil for just about everything! I would love to try these out! Prefer all natural ways to do things. Except for the Lavender, this sounds wonderful!!! i love lavender and peppermint! I love a lot of different essential oils, but especially tea tree oil, lavender, eucalyptus, lemon & lemongrass. Woohoo!! Love all essential oils. I would love to try more but so far Bergamot is my fav! Excited to start using essential oils! I absolutely love lavender and use it in a variety of things including bug spray and soap. Great giveaway I’d love to win. Thanks. I love the citrus essential oils. I have the book the Jabs printed and use it as my bible! Wonderful! I have slowly but surely been eliminating toxins from my household, I think the only commercial cleaner that is still being used is glass cleaner. Even my housekeeper has embraced all natural cleaning! The only oil I’ve used at home so far is tea tree oil. I would really love to start using other oils. This would be the perfect start. I have used several essential oils in my homemade cleaners. My favorite is my water/peppermint/vinegar/grapefruit seed oil mixture I use for countertops and the floor. It’s such a fresh smell! I love lavender! It’s so soothing. Oh how I want to win this! (For use in christmas gifts) 🙂 I love so many oils but I think tea tree is probably my favorite. I would love this! Love the lemon smell. I love adding essential oils to my homemade cleaning products from DIY Natural’s book! I would love to try the Sweet Orange. I have been making alot of my own home products, but have a hard time finding the oils locally. I will definitely be checking out Rose Mountain Herbs. Winning this would be a great start. I love using lavendar! I use a mix of them for flea spray, laundry and all my cleaners! Thanks for having a giveaway! My favorite oil is Lavender! It is the most versatile and it smells great! So many uses! I travel an hour plus to buy oils now as we don’t have a place local. I will try this website. Thanks!! I have been moving into the “all natural” living, one step at a time. I have been working with rosemary but would love to branch out into other oils. I love the tea tree oil because it is so versatile and it has done wonders for my acne!! I have a chemical free face now and I love it! My current favorite product is a DIY Chest Rub from Mommypotamus: http://www.mommypotamus.com/diy-vicks-vapor-rub/ I made it for both of my kiddo’s and it helps them sleep so much better at night and I feel better knowing I’m not putting nastyness on their skin, with the storebought rub we had to wash it off in the mornings, with this, it just soaks into their skin and helps to moisturize as well as heal! My husband loves clove oil, I put a couple drops on a cloth and keep it in his underwear drawer, he likes that I do that. I’m still learning all the uses for the oils, I love to wear Jasmine oil, just makes me feel great! Thank you for the giveaway entry!!! Very excited to explore some new oils! I love a combination of sweet orange and chamomile! It’s so soft and “gentle”. My favorite is eucalyptus oil, especially during the cold months. Just a few drops into the bath water gives a refreshing boost to the sinuses. I love Peppermint oil to relieve headaches. I have many friends who use essential oils in many different ways, and I’m looking forward using them soon for myself. I am exploring the world of herbs and oils! would love to win this giveaway! I need some better oils for cleaning. would love to try the lavender oil! lavender lavender lavender – it repells fleas, kills germs, smells great! I would love to win the oils and be able to try them all. Right now Tea Tree oil is the only oil I have and I use that for cleaning. I think lavender is my most used essential oil, but we use tea tree a lot as well. They are both great for cleaning and health issues. my go to EO is tea tree oil. I have been using it for over a decade. LOVE IT Cleaning, personal, and pet use, how great is that! Excited to get started with essential oils. My favorite herbal product is tea tree oil because it is so versatile & is almost always safe to use neat. I would love to win these oils – I have been wanting to try this brand!! I really enjoy the emails I get from DIY Natural! Thanks for organizing this giveaway! My favorite herbal product is Rosemary essential oil. I use it in my vinegar concoctions for cleaning around the house. I also use it in my hair rinse. I’ve recently started hearing about the benefits of Thyme, specifically in skincare and the treatment of acne. I’d like to learn more about that. Lavender is my favorite. I love to add it to dryer sheets, bath water and for headache relief. I would LOVE to win something like this. They have the best essential oils and TWELVE OF THEM!!! yes please! I would love to win this. I currently make my own mosquito spray, laundry detergent, dishwasher detergent, bathroom cleaners, & shampoo. There are lots of other home products & health & beauty products that I could make with these oils!! What a great give away. Thanks for your blog & all the information that you provide. I’ve gotten most of my recipes from you. Thanks so much for this post. The trial-and-error approach to finding a reliable source is oils is challenging on a tight budget. Thanks for doing the footwork! The lavender, peppermint, or rosemary would be great in the diy wrinkle releaser the spray. One of my favorite ways to use essential oil is as an air freshener. This year I got rid of my candles, etc., and like knowing that I’m not putting harmful chemicals in the air of our house. I hope to experiment more in the coming days with DIY products. Thanks for the giveaway!! I am ready to start trying some DIY natural projects. I would love to tackle the homemade detergent first, and having some of these oils would definitely help! I am excited to try lavendar, peppermint, and lemon! Tea tree oil is one of my favorites. So many uses. I love my jasmine oil, I am using it as a personal fragrance. I also love using cleaning products made with essential oils. It makes the work much more enjoyable. I look forward to learning more about these wonderful oils and their many uses. I love lavender oil cause of it’s relaxing & anti microbial effect! I already use it with tree oil in my laundrey detergent and would like to use it now in personal body care! I may be the only person I know who doesn’t like lavender – which stinks (no pun intended) because it has so many uses! Instead, I stick with the citrus and tea tree. I’ve been reading a lot about essential oils lately and have never experimented with them. I would love to make my own cleaning products! I love smelling eucalyptus when I’m congested. I would so love to win this. I haven’t tried as many home recipes as I want to because of a lack of oils. I’ll get them eventually, just not in the budget right now. If I were to win this giveaway it could change my world! So glad to find a new place to get high quality EOs! I’m going to have to say tea tree oil, since it’s the first essential oil I ever used. My favorite herb is probably Lavender. I love the smell of it! It also gives me a warm, fuzzy, soothing feeling when I just think about it. Can’t wait to use it with our baby baths! I’ve just recently started using essential oils, and since I love everything about your website, I’m sure I would love these oils! It’s difficult to know sometimes if you’re getting quality products, and I appreciate the fact that I can trust what you say! I can’t wait to try natural! I am so glad that I found your site. I’ve been studying about essential oils and their uses, so it would be wonderful to win this awesome giveaway prize. Thanks for all of your great info! Love the 12 pack! What a great way to alternate cleaning scents. What a wonderful giveaway. It would be awesome to have all of these oils in a collection. Yay! I LOVE MRH and DIY Natural! I grew up in a slightly “crunchy” home but buying DIY Natural really kicked my crunchiness into high gear. God Bless! Guess I didn’t share what my favorite products are. My go to EOs for cleaning and body care are lavender and tea tree and I love lemongrass EO in my diffuser. Right now I’ve got a jar of sunflower oil being infused with chamomile, calendula, and plantain (all from MRH) to make diaper cream! Thank you sooo much for a chance to win! This is an area that I have been wanting to learn more about! I’ve been dying to experiment with tea tree oil after reading a bunch of your recipes! You guys have really inspired me to ditch the commercial/chemical/toxic products in favor of all natural/safe products that do the job so much better anyway! Thanks so much! I’m beginning to experiment with essential oils and use them for hair care, skin care and cleaning. Wow – it will really help me make my DIY cleaning products. I love Lavender – so soothing. I’m just venturing into a more “natural” world and would love to be able to utilize all the different oils around my household. And I hear Mountain Rose oils are THE BEST!! I have used essential oils for years for many uses, my favorite it eucalyptus and tea tree mixed with pure aloe vera gel for sunburns, muscle aches, bug bites, headaches and many other uses. I am just beginning to learn about essential oils but they’ve already proved helpful in so many ways. We lost our essential oils kit when we moved to PA. We had been using it to make our homemade laundry soap, and also for making the house smell much better. I’d love to convert our bathroom cleaners to natural products, but we’re on hold right now because we can’t find the oils. This kit would be a lifesaver! I would love to try the clove bud because I think the scent would be wonderful for this time of year. My current favorite essential oil is lavender for its soothing and antibiotic properties. Peppermint Oil!! LOVE the smell and its working great for my husbands acne! This is a fantastic give away! I just made a facial cleanser this morning with lavender, bergamot and rose essential oils. It smells heavenly! I absolutely love using lavender, bergamont, and orange essential oils in my products. The natural soothing benefits of lavender paired with the sweetness and aromactics of the bergamont and orange is divine. Wow. All of those oils look wonderful. I would love to win them!!! Love this idea, the only oil I have used is Tea Tree oil. I would love to try other oils !!!! I love using essential oils in my homemade household cleaners. I can’t wait to learn and do more. Thank you for the opportunity to participate in this great giveaway. I LOVE essential oils, and I LOVe your blog. Seriously, I have learned so much and my ife has dramatically changed because of it. Specially making my own cleaners. I can never go back to store-bought; even if for some crazy reason it wass cheaper with coupons/supersales. Not worth it. what a great giveaway! i need this!! I use essential oil in my homemade laundry soap and in so many other things it would be great to win these!!! I love the DYI cleaners. I feel thrifty and that I am helping my health and everyones around me by not breathing in those harmful chemicals. I would love to win all these awesome oils! It’s so difficult to choose just one, but I’m leaning towards Lavender because it smells wonderful and it has so many functions. Just learning mostly. We have used some oils in making lip balm but am starting to branch out. Lavender worked great in helping my daughter after being stung by hornets! I love lavender. it is so calming. Our family is on a tight budget, but I am also concerned about bringing harsh and/or synthetic cleaners into my house, especially when planning a family. I haven’t used any essential oils yet because of price, but I’m excited to get started, first with tea tree oil to clean the house. Love the site! I love your site and. I would love to win!! thank you for this post; I’ve been thinking about essential oils, mainly tea tree oil, and haven’t done the research necessary to find a purchase location. you’ve done my work for me; thank you! I am becoming an virgin coconut oil lover – put it in soaps, mix it with peanut butter for a treat, put it in lotions. I also love peppermint oil. My favorite is the Eucalyptus because it really stops the coughing at night. Since I have a cold right now Frankincense and Wintergreen essential oils are my favorite to keep me breathing easily 🙂 Thanks for the opportunity! I love Mountain Rose Herbs! They are a great company! Tea Tree Oil has become my go-to for just about everything. I love putting it in the humidifier to help kill the nasty germs and even like the way it makes the house smell. I’m so excited about this giveaway!! I’m super new to essential oils and this would be the perfect way to get started! I love lavender! It is just so universal and the smell is amazing! The only thing I’ve used so far is Peppermint essential oil but I so want to try the others. Thanks for the chance! I’ve been collecting my essential oils one at a time, and use them often. I would love to win – I don’t have lavender yet. Love your website! I’d like to try cedarwood. I’m imagining it will make me feel like I’m outside on a walk on a crisp fall day. I am eager to use essential oils more often in my daily care. I’ve heard of many ways they can be used to promote health and well-being, but have only been able to try a few. So far, my favorites are peppermint and lavendar. First off I have to start by saying I love your website, your book, and everything you stand for. I have been gradually moving into the more natural approach to living and you are my “go to” for so many resources. My favorite essential oils are peppermint and sweet orange, they provide a great nautrual pick me up and in a diffuser they make my whole house smell fresh and clean. What an great give away, someone is going blessed by these oils. I can’t find the 12 pack on their website, but am very interested in it. I would love to try essential oils! I do make my own homemade shampoo but have never tried oils in it. Thanks for the giveaway! Thanks for the great giveaway. I have yet to try any essential oils but it is on my to do list and this would certainly help. Would love to win this! I’m just getting started but I love the peppermint, lavender and tea tree oils. Thanks for this opportunity. I like lemon balm, as it makes a really nice summer tea and you can also stop your mosquito bites from itching by crushing it and rubbing it on the bite. (Can you tell I’m missing summer today?) I also love bergamot and use the oil in most of the personal care products I make. 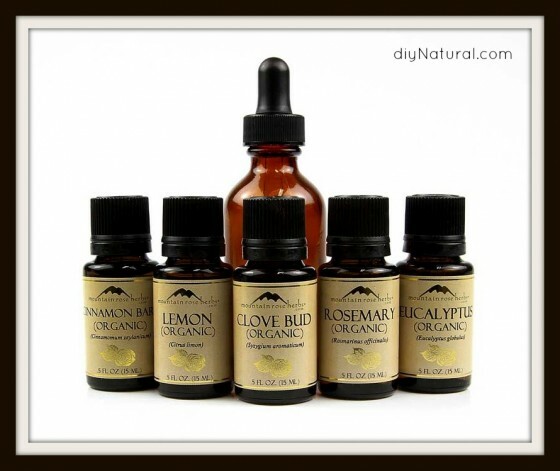 I have ordered Mountain Rose Herbs lavender oil and loved it! I would so enjoy having a whole selection of herbs to make natural cleaners, including thieves oil for helping prevent illness this winter. I am a home care nurse, and I see lots of people, which means many opportunities to get sick! Ooooo it would be lovely to have the kit! Let the green cleaning begin!!! With a busy family, I use lavender oil to help calm the world around me. I love using sweet orange essential oil in my white vinegar fabric softener! I’d like to try using witch hazel and many more as I use several to clean with already. I use primarily Lavender, Tea Tree Oil, Eucalyptus, and Sweet Orange Oils in our home. Most of these get added to baths or air conditioning/vacuum filters in order to help our house smell great … but I am very interested in expanding my use of essential oils and learning about homemade cleaners. The amount of toxins and “unknown” chemicals that are surrounding us everyday is freaking me out and I am trying to cut back on as much as possible to keep us healthy! I love getting my e-mail and seeing a new post from dyi – you have inspired me to live a more natural lifestyle one step at a time. I am looking forward to taking the next steps by eliminating chemical cleaners – we have already bought a steam cleaner – and it is doing a great job!! Who would have thought really hot water could clean some of the grimest dirt. Thank you for hosting such a great give-away!! I am so interested in learning more about essential oils and working them into our daily lives! lavender and peppermint seem to be my all around go to oils…but I’m just beginning to learn. hmmm…fave oil…that’s a tough one. i love the uplifting essence of grapefruit and my girls love lavender in their baths in the evenings. i also add tea tree to their baths. i feel it keeps ’em “weller” during these winter months. 🙂 i am especially thankful for clove and luckily, have not needed to use it for teeth. thanks y’all! I am looking forward to learning more about essential oils and how to use them to be clean, healthy, and non-toxic in my home. Thank you for this opportunity! Great giveaway! I love essential oils for so many uses. My favorites are lavender and tea tree, they are so versatile! i have never used essential oils. i have been reading about them and would like to try them. Rosemary oil is great for hair and skin. I like the smell of it too and want to try it in my homemade laundry soap. I love clove and oregano. I’d like to try Elderberry. Haven’t used any essentials oils, just can’t find them where I live to try. Would love to try before investing in different oils. What a great giveaway. Appreciate the chance to win essential oils:o) I started using essential oils a couple of years ago, because I was looking to make my own cleaners. When looking into purchasing e.o.’s I came across a product which contains Eucalyptus globulus, Eucalyptus citriodora, Myrtle, Eucalyptus radiata, Peppermint, Spruce, Ravintsara, Pine and Marjoram. I bought a diffuser and put a few drops in it. I love using this e.o. product, because it helps considerably with my son’s asthmatic bronchitis or any type of cold which affects his breathing. I also use other essential oils in the diffuser, as well. I love essential oils and learning new ways to use herbs. I think an essential oil I’d like to try is cardamom. I am imagining how cool it would be to make a “chai tea” lip balm for Christmas gifts! I have wanted to try their oils for some time now. This would be a fabulous way to get started with them! Eucalyptus and wintergreen have helped me tremendously with the cough/congestion that has been going around. Alas, I am nearly out….. I am really interested in using essential oils in my day to day life…thanks for the giveaway! Gosh, I love so many of the herbs and oils and use them for many different things. Thanks for offering such a great giveaway. Thanks for the post! I’m excited to give them a try. I would love to use more essential oils. I have tea tree, eucalyptus, and lavender. I’ve tried the lavender in the vinegar for fabric softener. love it. Can you use lavender oils in homemade powder laundry detergent? My favorite herb at the moment is Lavender. I use a lot of essential oils in my salves and lotion bars. I love Mountain Rose Herbs, too, for the awesome customer service, organic and fair trade products, and reasonable prices. Although I have several essential oils as staples in my stay healthy arensal, lately I have become quite found on eucalyptus oil in the vaporizer for relieving stuffy sinuses. Bergamot is my favorite essential oil. I love using different oils in my body scrub that is made of sugar and olive oil. My favorite scent is lime. My boyfriend uses tangerine or grapefruit. We use vanilla in a warmer in our kitchen. Also use them in sprays as room deoderizers with white vinegar and water. So hard to pick just one. Lavender, peppermint and tea tree are all my favorites but used for different purposes. I love your DIy book. I’ve made over half of the cleaners and it is a great resource! Thank you guys! I love essential oils! The Eucalyptus would be good at this time of year. What a generous act of kindness this is to be giving away such a wonderful gift with so many uses. I look forward to learning more about your company and products in the future. May you continue to be who you are and carry on such great acts. What a great idea for a contest! I use essential oils a lot, both at home and at work (trainer at a doggie daycare and dog training facility.) For example, we spritz lavender oil spray around the area to help calm reactive or anxious dogs. I’m still learning to use herbs/essential oils, but my favorite go-to right now is lavender! Helps everyone relax and calm down after a busy day. I confess: I’m a longtime mostly-lurker. While I regularly share your posts on Facebook and Pinterest, I’ve only commented one time before this. I use peppermint oil in my lip balm. Love it! I so love lavender essential oil – and want to try others. What a great giveaway!